The Custom Fields feature gives you the option to add more fields to your booking form so as to customize it to best match your business needs. 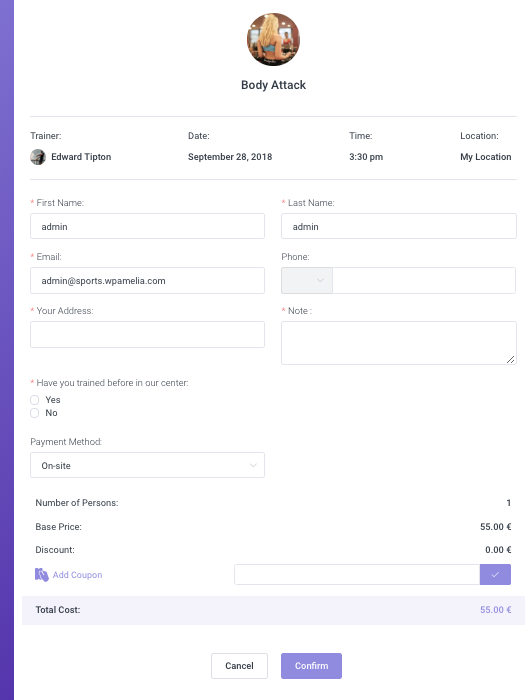 Customer’s first and last name, email address, and phone number are there by default, but with the Custom Fields feature you can add extra fields if you want to ask a customer a question, collect additional personal details, or for any other reason. 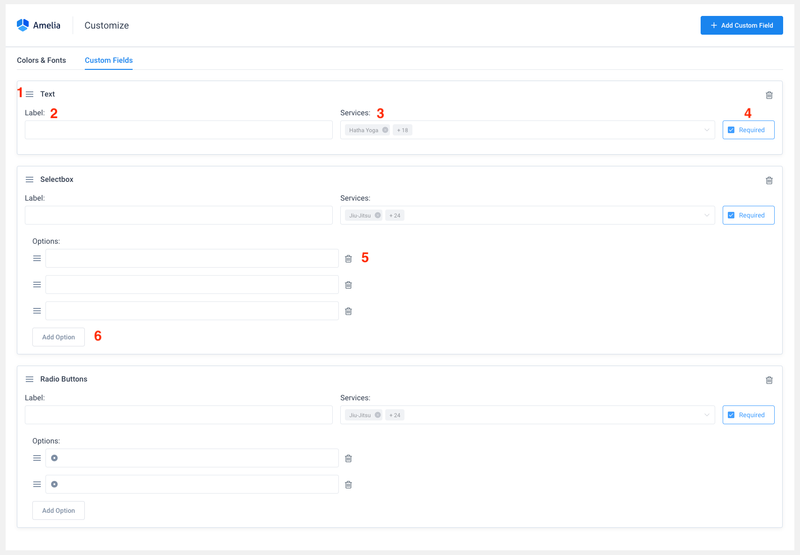 These fields will appear on the Booking form under the default fields, and once your customer fills them this information will be shown in the appointment information on the back-end. There are several field types you can add: Text, Text Area, Text Content, Selectbox, Checkbox and Radio buttons, and you can add as many fields as you need. In the Text Content custom field from version 1.4.4 you can also add HTML so you can add links, pictures, colors, etc. to customize the text better. To add fields you need, go to the “Customize” page and click on the Custom Fields tab located beside the Colors & Fonts tab. Click on the “Add Custom Fields” button and choose one of the field types, or use the “+” button at the bottom of the page to add it. Ordering – Use this option to reorder your custom fields – the order you set here will be the order customers will see on the booking form. Label – Use this option to enter the name of your field. The name can be in from of a question, and additional option, or whatever you need. Services – If you have multiple services and you require additional information for one or more of them, you can set it here. The Services option allows you to choose the services for which this field will be displayed. Required – Here you can set whether the field will be required or not. By default, when you add a field this option is enabled, but you can set it different for every field. Delete – Besides of each field there is a trash can, so you can delete it with one click. There are also trash cans beside each option you add for the selectbox, checkbox, and radio button fields. Add Option – this option is visible for the selectbox, checkbox, and radio button fields, and enables you to add as many options as you need for each of these fields. Once you’ve finished setting up the custom fields, refresh your booking form and the fields will become visible to you and your customers. By clicking on the appointment in the appointments list. After you click on it, the appointment will expand and show the additional information. By opening the Edit Appointment dialog. When you open the Edit Appointment dialog you will see a new “Custom fields” tab. There you can see the additional information from your customers, and you can also edit it if the customers send you some changes, for example. If at a later time you want to change some field or delete it, don’t worry. The customers’ information collected before the change will stay in the scheduled appointments, and the change will only affect new appointments.